This is a great activity for a warm sunny day. First we filled a couple of muffin trays with water. 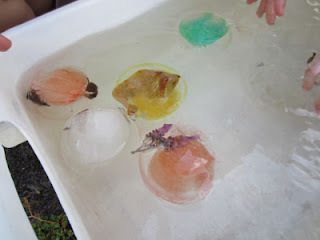 We put food colouring in the water, mixing up a slightly different colour for each hole (although the colours were difficult to see against the dark muffin tray, it did make them prettier in the water). We then collected a variety of small things from flowers and leaves to plastic toys, old shells and coins, and dropped one in each hole. And then for the most difficult part of this activity: waiting for it all to freeze. Once the ice was frozen, we filled a tub with water, put the ice cubes in and watched them melt. It was interesting for the kids to see what would float and what would sink, and they though it was very exciting to watch the ice melt and see what melted first and see the treasures re-appear. But above all, they just enjoyed getting their hands wet and cold. 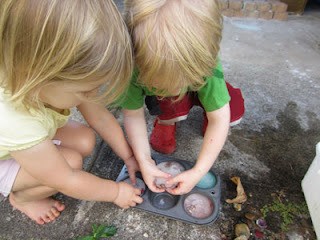 They enjoyed this activity so much we immediately made a few more batches, and we even made a couple of bowls of ice to take to kindy for their water play table.